Kids' science experiments teach children about the world around them. Science encourages higher thinking skills, and shows children how things work. 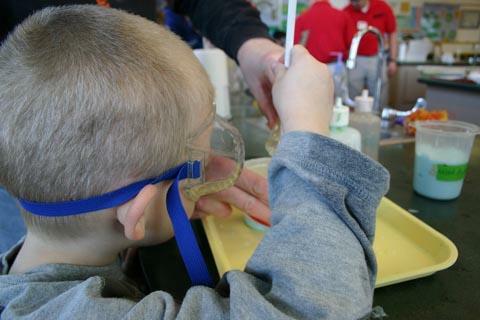 Before beginning any kids' science experiments, review the safety rules and always have an adult supervise. The first thing in any science experiment is to create a hypothesis. A hypothesis is a statement that can be either true or false. The entire experiment will center around the hypothesis to prove it correct or incorrect. For example, students could state that Detergent A washes out stains better than Detergent B. An experiment can than be designed that tests this theory. The next step is to gather materials that will be used in the science experiment. The key here is to make sure the materials are all the same. For example, if you are testing different detergents, the experiment will only be scientifically correct is the stains and shirts are identical and only the detergent is the variable, or different ingredient in the experiment. It would not be fair to test the stains on various materials, such as one stain on a cotton shirt and one stain on a silk shirt during one trial because the results could be skewed by other factors as opposed to the actual detergents. Likewise, if Detergent A is being tested using cold water, then Detergent B should also be tested using cold water. In any kids' science experiment, is important to identify the independent variable. The independent variable is the factor that is changing. In this case, the only factor that should be changing is the detergent and nothing else. The dependent variable is the result caused by the independent variable. For example, how well was the stain washed out? After completing the experiment, kids must evaluate the data gathered to come to a conclusion if Detergent A is really better than Detergent B. Testing different detergents on various stains. Dropping objects of varying weights and sizes and timing them to see which one falls faster. Conduct a survey to see which advertising colors are more appealing to consumers? Which cleaning solution works better on floors? Which garbage bag holds up better? Conduct a survey to see if consumers can tell the difference between a name brand soda from a generic brand soda. Determine which kind of tape will hold a picture up longer. Does buttered or plain popcorn pop faster? Does getting eight hours of sleep improve school performance? Will fruit last longer if it is refrigerated? The first step is to come up with an idea, or theory, that may or may not be true. There are all kinds of science experiments that one can do to test their idea by following the scientific method that is outlined above. Then an experiment must be designed and carried out so that it is scientifically correct. The results are then discussed and compared to the original statement. Science Experiments With Mold By Erin Coleman, R.D., L.D.